Chitragupt Shrivastava, the famous music composer of Bollywood, of Rafi & Mukesh era, of "Chal Ud Ja Re Panchhi Ke.. from (Film Bhabhi)" fame, hailed from Saran. Chitragupt was born on 16 November 1917, Karmaini village (Gopalganj district), Bihar. He had a double MA, in Economics & in Journalism.He Worked as a lecturer in Patna before he ran away to Bombay to pursue a career as a composer in films.He assisted S.N. Tripathi for some time before he got an independent opportunity with Ramnik Vaidya in 1946. He tasted success after a struggle in 1952 with the Rafi-Shamshad duet, adaa se jhoomate hue (Sindbad the sailor) hit the music charts and was a hit. S D Burman recommended him to Meiyappan of AVM studios, and he started with a film Shiv Bhakt in 1955. Bhabhi, Barkha, Main Chup Rahoongi and Main bhi ladki hoon were the other notable ventures of this collaboration. He worked with few big name studios or actors - with Mohan Sehgal, Hrishikesh Mukherjee, G P Sippy, Kishore Sahu and AVM being the exceptions. He parted ways with his mentor, S N Tripathi, due to their difference in their innovative approaches and ideas from popular Western music. His classical roots are seen in songs like Kishore Kumar's "paayal vaali dekhna" (Ek Raaz), while his modern and light-hearted, foot-tapping music could be sampled in songs like "ham matavale naujavan" (Barkha), "dekho mausam kya bahaar hai" (Opera House). His notable films include Bhabhi, Ek Raaz, Main Chup Rahoongi, Oonche Log, Opera House, Vasna, Zabak etc. 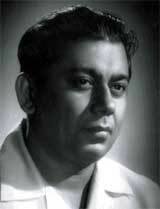 Chitragupt was also a good singer and lyricist. He worked with all the major lyricists of the time - Majrooh, Rajinder Krishan, Anand Bakshi, Prem Dhawan and even Sahir.After Sahir Ludhianvi agreed to write to the tunes Chitragupt composed, they produced some wonderful songs in collaboration for Vasna - ye parbaton ke daayre, itani naazuk na bano. When it came to Bhojpuri films, Chitragupt was the ruling king.He also composed the music for a few Punjabi and Gujarati films, as well as the music for an MGR film dubbed from Tamil. The songs composed by Chitragupta for some of the AVM classics such as Bhabhi, Barkha and Main Chup Rahungi are unforgettable. We mention some here and you will agree — 'Chal ud jaa re panchi ki ab ye desh hua begaana...' sung by Mohd. Rafi, 'Chali chali re patang meri chali re...' sung by Mohd. Rafi and Lata Mangeshkar, and 'Chupakar meri aankhon se...' again sung by Rafi and Lata. All three songs are from Bhabhi. The first mentioned is a real gem, thanks to the splendid lyrics by Rajendra Krishan and a soulful rendition by Rafi. The songs from Barkha like 'Ek raat mein do do chaand khile...' sung by Mukesh and Lata Mangeshkar, 'Tadpaoge tadpa lo hum tadap tadap kar bhi...' sung by Lata Mangeshkar, and the song from Main Chup Rahungi, namely 'Main kaun hoon main kahan hoon...' sung by Mohd. Rafi and 'Koi bata de dil hai jahan kyun hota hai dard wahan...' sung by Lata Mangeshkar and Mohd. Rafi are remembered to date. Other beautiful compositions of Chitragupta are 'Agar dil kisise lagaya na hota...' from Bada Aadmi sung with a lot of depth by Mohd. Rafi, 'Mujhe dard-e-dil ka pata na tha...' sung by Mohd. Rafi and 'Dil ka diya jalake gaya, Ye kaun meri tanhai mein...' sung by Lata Mangeshkar. The last two songs are from the film Akashdeep. Also, one can't forget 'Saathi hai albela phir bhi koi akela...' sung by Mukesh from Hum Matwale Naujawan, 'Balma maane na bairi chup na rahe...' sung by Lata Mangeshkar from Opera House, 'Kaanha jaa re teri murli ki dhun...' from a strangely titled film Tel Maalish Boot Polish (but the song was very classical and beautifully sung by Manna Dey and Lata Mangeshkar). A devotional song composed by Chitragupta 'Jai Jai he Jagdambe Maata...' sung by Lata Mangeshkar for Ganga Ki Leheren is among the few good ones. The duet from the same film by Kishore Kumar and Lata Mangeshkar, namely 'Machalti hui hawa mein chum chum hamare sang sang chale Ganga ki lehren...' written well by Majrooh Sultanpuri, takes us straight to the banks of the holy Ganga. Talking of duets, you have some of the best duets coming from Chitragupta like 'Dekho mausam kya bahar hai, sara alam bekrar hai...' sung by Mukesh and Lata Mangeshkar from Opera House; 'Tumne haseen hi haseen mein kyun dil churaya jawab do...' sung by Mahendra Kapoor and Lata Mangeshkar from Ghar Basake Dekho; 'Laagi toote na ab to sanam...' sung by Mohd. Rafi and Lata Mangeshkar from Kali Topi Laal Rumal; 'Ye parbaton ke daayre ye shaam ka dhuan...' sung by Mohd Rafi and Lata Mangeshkar from Vaasna; 'Ajnabi se banke karo na kinara...' sung by Kishore Kumar and Lata Mangeshkar from Ek Raaz; 'Teri duniya se door chale hoke majboor humein yaad rakhna...' sung by Mohd. Rafi and Lata Mangeshkar and 'Mehlon ne chheen liya bachpan ka pyar mera...' sung by Mukesh and Lata Mangeshkar, both from Zabak. He suffered a heart attack in 1968 and a paralytic stroke in 1974. He died on the 14th of January 1991.His children, Anand and Milind (who can forget their song from QSQT, "Papa Kahate hai Bada nam karega..." which lauched Amir Khan into incredible stardom! ), the composer duo, and Sulakshana and Vijayeta Pandit, the singer-actresses have also made an impact on the film world.